MADRID — Chile’s “Los Perros” and Argentina’s “Hunting Season” and “The Desert Bride” are set for France’s 31st Toulouse Cinelatino Fest Films in Progress showcase, which has often proved a gateway to big festival selection, beginning with May’s Cannes Festival. Of Toulouse’s six entries last year. “The Blind Christ” and “The Winter” went on play in competition at Venice and San Sebastian respectively; “Don’t Swallow My Heart, Alligator Girl!” was selected for Sundance. Running March 23-24, Films in Progress will host four films from women directors and five debuts. That said, some titles are already currying expectation given the pedigree of their producers. Lead-produced by France’s Cinema Defacto (“As We Were Dreaming”) and Chile’s Jirafa Films (“Much Ado About Nothing,” “The Blind Christ”), “Los Perros” marks the anticipated second feature from Marcela Said whose fiction debut, “The Summer of Flying Fish” was selected for Cannes’ Directors’ Fortnight and proved one of the two first movie acquisitions made for Latin America by AMC’s new Sundance Channel in Latin America. Argentina’s REI Cinema, Germany’s Augenschein Filmproduktion and Portugal’s Terratreme Filmes co-produce a title which may prove polemical, as it charts the sexual attraction between and upper-class woman and her horse-riding instructor – despite his being prosecuted for his part in the Pinochet regime’s torture and murder of dissidents. Also produced by Argentina’s REI Cine, a company behind Lucrecia Martel’s “Zama,” along with New York.-based Gamechanger Films, Germany’s Augenschein Filmproduktion, France’s Les Films de l’Etranger and Qatar’s Doha Film Institute, “Hunting Season” is a Patagonia-set father-son drama which reps the first feature from Argentina’s Natalia Garagiolia, whose short, “Sundays,” opened Cannes’ Directors’ Fortnight. “Hunting Season” also underscores a pioneering investment outside by the U.S. by Gamechanger, which exclusively finances feature films directed by women. It turns on Nahuel (Lauturo Bettoni), who after his mother dies, is forced to go and live with his estranged father, a hunter in Patagonia’s forests. There, Nahuel will discover love, and his capacity to kill. 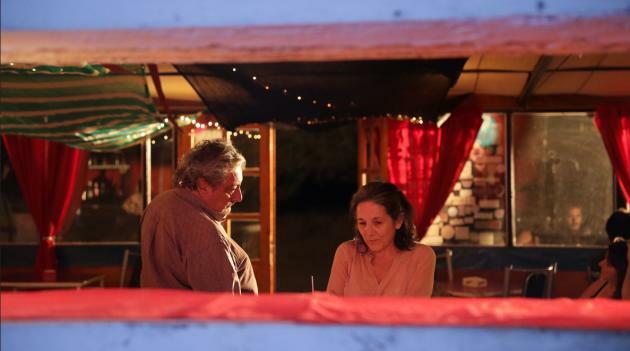 The first feature of Argentine filmmakers Cecilia Atan and Valeria Pivato, “The Desert Bride” stars Paulina Garcia, a Berlin best actress winner for Sebastian Lelio’s “Gloria,” as a 54-year-old woman who works as a live-in maid in Buenos Aires. When the family sells the house, she is obliged to take a job in the town of San Juan, a provincial capital surrounded by arid plains.It proves her salvation. “The Desert Bride” is produced out of Argentina by El Perro en la Luna, Sebastian Mignona’s label, and Haddock Films, producer of Academy Award-winning “The Secret in Their Eyes.” Eva Lauria, Raúl Aragón and the directors also produce. Based out of Chile, Ceibita Films, which presented “Las hijas de Alonso” at last year’s San Sebastian, co-produces. Selected for San Sebastian’s 2014 Europe-Latin American Co-production Forum, Chile’s Sanfic Industry Lab and Australab-FicValdivia, “Marilyn” is produced by Maravilla Cine’s Buenos Aires-based Paula Zyngierman, production manager on standout Argentine films such as Adrian Caetano’s “Chronicle of an Escape” and Lucia Puenzo’s “The Fish Child.” It is co-produced by Chile’s Don Quijote and Rampante, both run by Giancarlo Nasi (“Land and Shade,” “Jesus”), and Uruguay’s Cordon Films, the production label of actor-director-producer Daniel Handler and Micaela Sole. Argentine Martin Rodriguez Redondo’s feature debut, “Marilyn” is based on the true story of Marcelo B, today called Marilyn, who was sentenced to life imprisonment for shooting dead his mother and brother with a shotgun in 2009 and then became a partner in Argentina’s first gay marriage in prison. Two more Toulouse Films in Progress titles turn on broken families: “Jasmines in Lidice,” from Venezuela’s Ruben Sierra Salles is an ensemble drama, set at a conflictive birthday party, turning on a mother and two daughters who all mourn the murder of their sons. Influenced by the films of Naomi Kawase, “Jasmines in Lidice” is inspired by a stage play by Venezuela’s Karín Valecillos, who adapted her work for the big screen, tutored by Arturo Ripstein’s scribe, Paz Alicia Garcidiego. “Half Brother,” the feature debut of Rio de Janeiro-based Eliane Coster (“A Boca do Mundo”), tracks a teen girl who, after her mother disappears, seeks out her half-brother. She discovers he is being threatened not to leak a video he made on his phone of a homophobic attack on a friend he’s secretly attached to.